In 2016, my team at Golin was tasked with an interesting challenge: share the news that the McRib was back in a fresh new way, also keeping in mind that it was in fewer restaurants than in 2015. How'd we do it? 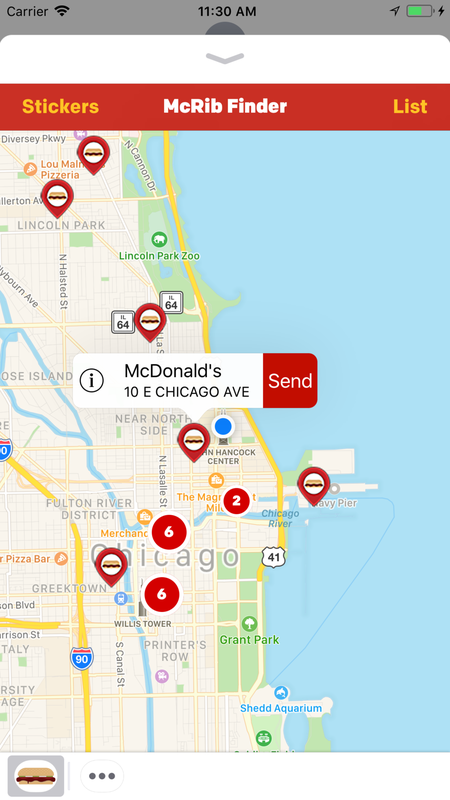 We created an iMessage app that quickly shows you where the nearest McRib is, coordinate a meet-up with friends (a meat-up, if you will), and get turn-by-turn directions. All without having to leave Messages. 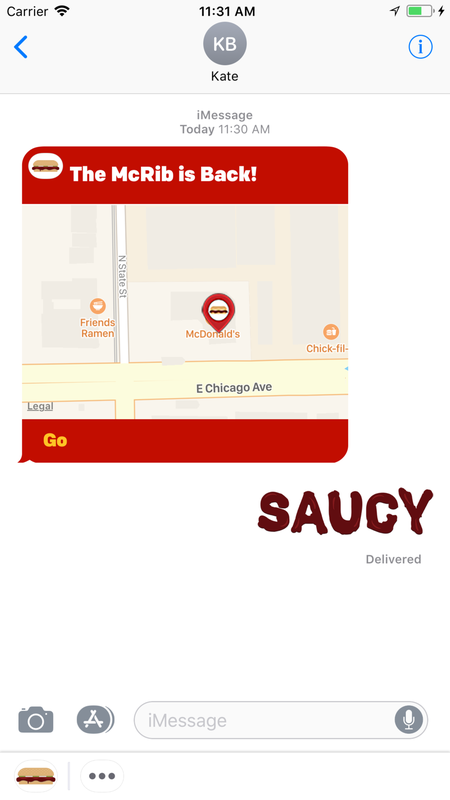 For 2017, we upped our game by making putting live maps to the McRib into the app's messages. We also added some great new stickers. We didn't stop there, though. We also rolled out an Android version—my first Android app. 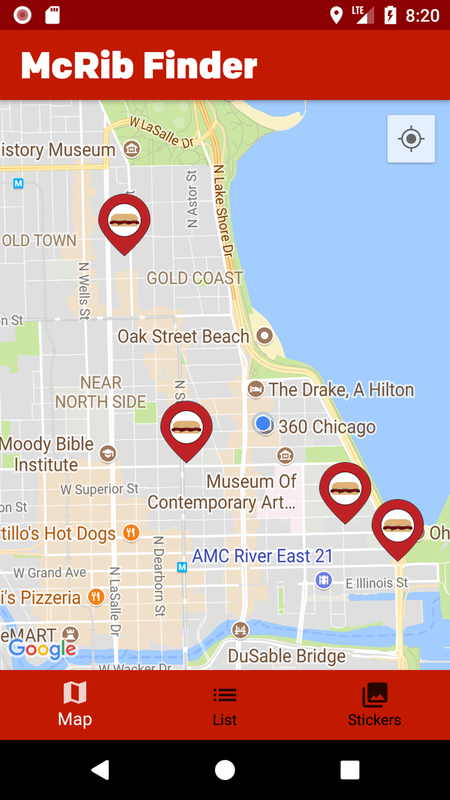 The McRib Finder uses your current location to highlight the participating McDonald's restaurants nearby. A Core Data stack underneath helps make loading restaurants a breeze, while some POI clustering keeps the map neat and clean. We tapped the Messages framework introduced in iOS 10 as much as possible with the McRib Finder. Our custom message type delivers the location a user had chosen for the meet-up so anyone in the thread could get directions. What's an iMessage app without stickers? 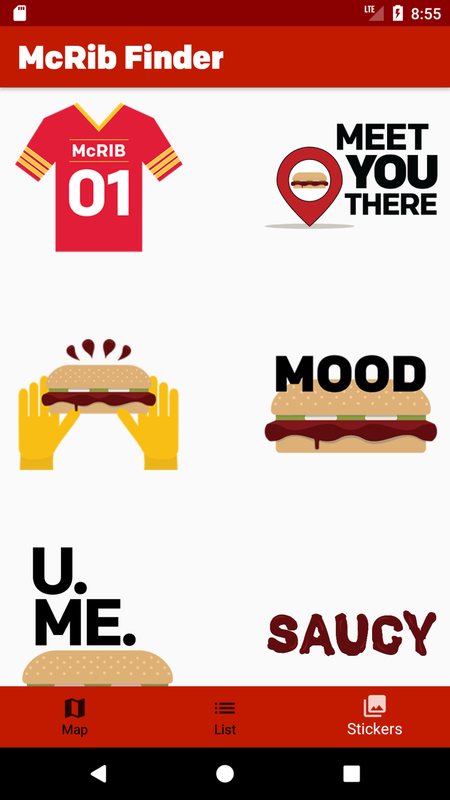 We've created some tangy animated and static stickers for McRib fans everywhere so they can spread their Team McRib spirit.